Delaware has had a varied series of Europeans claiming the lands and its borders and ownership shifted many times during the Colonial period. The Dutch were the first to claim the lands but they quarrelled with the local Indians and were wiped out to a man in 1631. Meanwhile the King of Sweden had set up a company to undertake colonisation in the New World and the disaster that had befallen the Dutch was an opportunity for the Swedes to move into the area and in 1638 two ships sailed to the Delaware. Old World quarrels spilled into the New World and the Dutch and the Swedes fought each other in 1655. The Dutch proved the stronger and put an end to New Sweden and incorporated the lands in to New Netherlands. The Dutch would lose their New Netherlands in 1664 (See New York for details.) and the Delaware region would be part of the spoils. 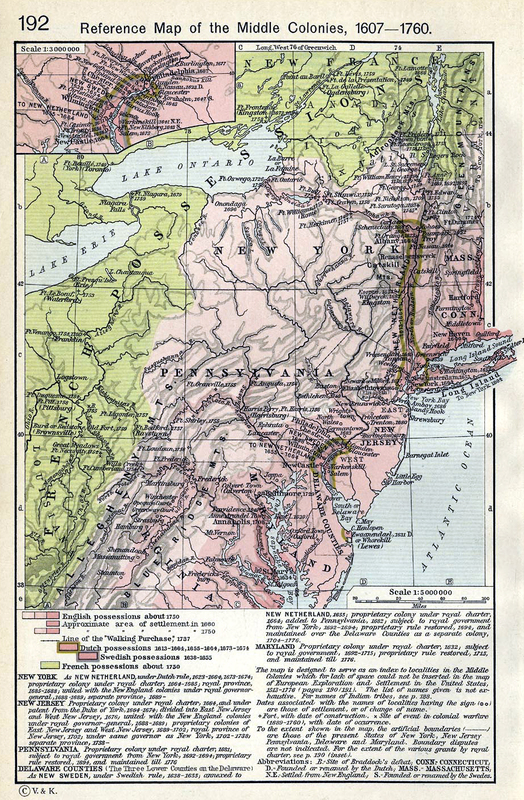 In fact the English would keep Delaware incorporated into the New York colony until 1682 when it was claimed as part of William Penn's Pennsylvania purchase. However the area secured a separate legislature in 1704, under a charter of privileges granted by William Penn although it maintained strong links with Pennsylvania up until the Revolution. 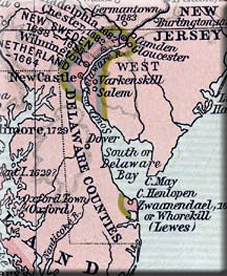 It would be referred to as "The Three Lower Counties on the Delaware" (New Castle, Kent, and Sussex) rather than as a colony in its own right.